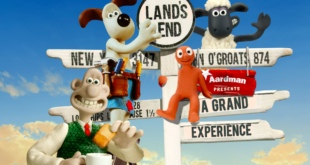 The Aardman Presents: A Grand Experience attraction is based at Land’s End and replaces the successful Shaun the Sheep Experience. London Resort Company Holdings plans to open the park in Easter 2020. The half hour long feature Shaun the Sheep and The Farmer's Llamas will hit the small screen in time for Christmas 2015. A Grand Day Out and A Close Shave will join Shaun the Sheep's Off the Baa in the content library. Firm to produce t-shirts and nightwear featuring Aardman characters.